The Environmental Fellows Program is designed to compliment your academic pursuit of any major that DePauw has to offer. The Environmental Fellows Program is a four-year honors program for students who are interested in addressing the complex, interdisciplinary environmental challenges facing humanity today. During the first year, Environmental Fellows will participate in a environmentally focused first-year seminar. Fellows will also attend luncheon discussions with faculty members, professionals, and their upperclassman colleagues. Sophomores will begin the process of fulfilling the summer-long or full semester practicum component of the program. This experiential learning opportunity could take the form of research with faculty, internships, or off campus study. As juniors, Environmental Fellows are expected to continue developing and exercising collaborative leadership skills by serving on a student advisory board. This will involve assuming responsibility for planning environmentally themed co-curricular events and activities to take place during the year. Finally, seniors will take part in a capstone seminar that will call on them to integrate all the aspects of their environmental education. Upon graduation, seniors will have completed six environmentally focused courses- three in the social sciences, humanities, and arts and three in the natural sciences. Each semester, Environmental Fellows attend special lectures, luncheons, and seminars sponsored by the Environmental Fellows Program and other organizations on campus. Please see our Speakers & Events section for more information and check out our calendar. Environmental Fellows choose between six environmentally focused courses - three in the social sciences, humanities, and arts and three in the natural sciences - to be completed before graduation. Courses change each semester. The Office of Sustainability connects our campus, the community, and the environment. 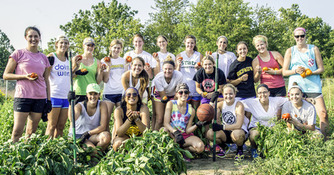 Learn more about the Presidents' Climate Commitment, DePauw's Campus Farm, and other sustainability efforts taking place at DePauw!